They were born on a distant planet, and brought their fight to Earth. Zorei and Kadian started out as companions in the distant reaches of space. But when they fled their homeworld to take refuge on Earth, it was the beginning of a fight that would catch innocent people in the crossfire. One of those people is going to be more than either of them can handle. Alexandra is a mischievous reporter and a protective best friend. When her lifelong BFF is in danger of getting sucked into a battle between aliens, she doesn’t hesitate to deceive the world to save her friend and to give herself a front-row seat to the fight. She wants answers, and she’s going to get them – even if it means risking her safety and uncovering lies far more horrifying than her own. Snarky, witty, hilarious and heartbreaking, this dark twist on the superhero genre will have you laughing, crying and holding your breath until the story is over. ​Heroic Lies starts in the middle, and goes back and forth to establish context. Initially it’s jarring and you’re unsure of what’s going on, but then that only serves to provide necessary breaks in the action and to offer much more plot and character development. As the story progresses, you find yourself drawn into it more and more, like any good book will. At the climax, you simply won’t believe what’s happening, and then your heart will be proverbially ripped from your chest by the storyline. The action may only encompass a few hours, but the entire story spans decades. I read the book in a few hours; it’s one of those you simply can’t put down. Put bluntly, just read the book. This had me hooked from the opening. I listen to audiobooks while I drive to work, and I was listening to Dan Brown's fast-paced best-selling "Inferno" while I was reading this at home, and honestly, I just couldn't wait to get out of the car and get home to read "Heroic Lies" instead. I inhaled it - a fantastic, leaping read that leaves me craving a sequel. The main character Alexandra cracked me up endlessly; I couldn't get enough of her. The storyline jumps around in an ever-changing landscape of characters and events, and the underlying material is a nice change. It's incredibly interesting how the author toys with the hero-villain-damsel complexes that our societies cling to, and the story was oddly immersive - I still keep thinking about the characters as if I know them in real life. All in all, I think this is a must-read, and it's very accessible - you don't need a long attention span to enjoy it, and it comes off more raw than most of your preened science fiction nowadays. 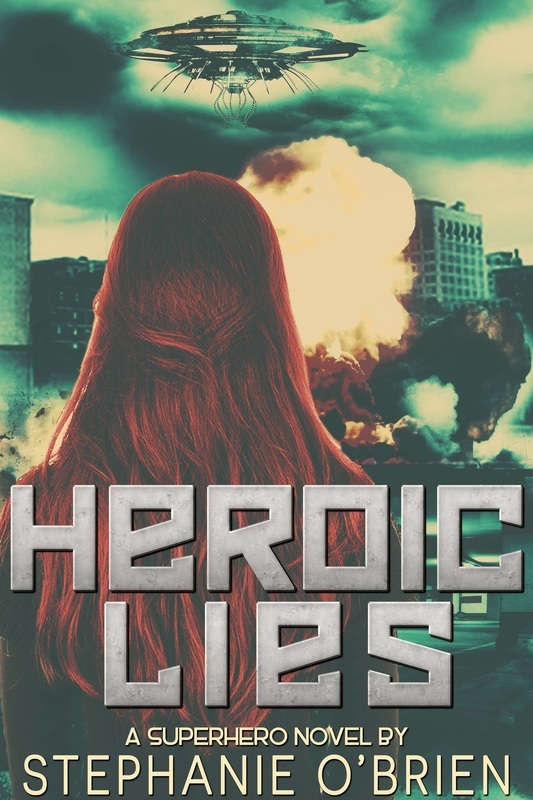 ​Scroll down to read a free excerpt of Heroic Lies! Alexa bit her lower lip delicately, perfect white teeth sinking into the soft pink of her carefully coloured skin. Her blonde curls bobbed around her meticulously made-up face as she turned it quickly toward her friend, giving her the same concerned half-pout that she used to use on boys when she was in middle school. Alexandra gave an exaggerated half-sigh, smiling the whole while. The other woman could pretend to sulk all she wanted, but the two of them wouldn’t still be friends if Alexa couldn’t handle a bit of good-natured teasing. Surprise and excitement collided in Alexandra’s chest, and she slowly raised her eyebrows, the closest thing to a cross between “SCORE!” and a flat, startled “what” that she’d allow herself to display. Part of being a BFF was, after all, to be unshockable, and not to use her friend’s personal relationships to dig for facts. “Stop it!” Alexa’s voice rose to an embarrassed half-wail, but a smile was edging its way back onto her face, and Alexandra knew that her attempts at reassurance were starting to take effect. Her voice died in mid-sentence, and her sharp eyes suddenly lifted to sweep their surroundings, seeking the source the sound that had invaded her senses. Her body, leaning conspiratorially over her friend just a moment ago, straightened abruptly, and every muscle in her slender limbs tensed with wary dread. A smooth, familiar voice seized the redhead’s full attention, and Alexa shrank back in fear as a tall blue shape stepped into view. Alexa glanced sharply at Alexandra, visibly startled both by the lie, and by the near-perfect imitation of her own voice. Her attempt to scream was abruptly cut off, reduced to a smothered, high-pitched squeal by the hand that had clamped itself over her mouth and nose. Alexa promptly made up for her friend’s inability, and the piercing shriek that rose from her chest made Zorei and his prey flinch in tandem. An instant later, a long tentacle snaked around the blonde woman’s throat, applying just enough pressure to frighten her into silence. Startled by her antagonist’s formidable speed, Alexandra reflexively lapsed into silence, setting the need to make noise aside in favour of trying to observe everything about the situation at once. Alexa had no such reflex; her eyes had started to fill with tears, and her shaking and whimpering was enough to give the calmer captive’s quest for information something to focus on. His hand had loosened on her mouth, and she forced her voice into steadiness as she seized the opportunity. It was easier than she’d thought it would be; while the tense power in his arms made it clear that she was physically outmatched, her memories of the other abducted women suggested that she wasn’t in immediate danger. A few persistent neurons in the back of her mind were already writing the story of this incident, but the rest of her focus bent itself to the task of keeping her gaze fixed on his, and settling her voice into a tone of frightened but firm persuasion. The golden-haired girl gave a weak nod, and while the alien’s eyes were fixed on her friend, Alexandra nodded in return. Then she gave a quick wink and smile, allowing a hint of her suddenly growing excitement to leak through. Front-row seat for an alien battle, WOOO! ​This could be awesome. Just so long as Zorei doesn’t break his pattern, and make a liar out of me. Judging by the slight, spasmodic twitch, Zorei came within half a second of dropping her. Recovering at the last instant, he tightened his grip on his prey, pinning her legs together with one arm and her arms to her sides with the other. Another twitch, this one giving no indication that she was at risk of being placed at the mercy of gravity. Alexandra made a mental note of the reaction and the button she’d pushed in order to get it, then temporarily switched topics. The entire way there, Zorei had been staring resolutely ahead of him, half ignoring her persistent chatter, but that last statement got the better of him. “Bridal?” he echoed, glancing down at her incredulously, and Alexandra opened her eyes wide in an attempt to look innocent. “Wedding.” His voice had gone completely flat, and she got the impression that there was probably a ‘loading’ screen somewhere inside his head. “Fine, then. I hate tea anyway. Hot chocolate is much better.” Alexandra turned her back on him and started to walk – toward the centre of the room, instead of the chair. The movement caused the seat to rock past its centre of gravity, and for the second time in half a second Alexandra felt her heart make a violent attempt to escape by way of her throat. “He’s not up for discussion.” The terse statement came in a tone that brooked no argument, and it was punctuated by a sharp movement as Zorei shifted her chair upright. The corner of his mouth moved down and sideways, just a little. It was a hard movement to read; either he was accustomed to putting up a mask, or he just didn’t have a very expressive face. For a long moment, Zorei simply stared at her. His pupils had dilated in the darkness of the lair, and as Alexandra watched a wave of conflict go churning through his eyes, she couldn’t help but think that in this moment, they almost looked human.